There are a lot of ways that a modern smartphone can be used to enhance your experience in the outdoors, but it is important to acknowledge up front that this can be a controversial topic. A smartphone is not only electronic, it is a full computer, which can break, run low on power, or otherwise malfunction. One thing that should always be assumed is that there may not be any access to cellular signal for voice calls or internet data. It is important to observe all of the standard practices of outdoors safety: to carry a physical copy of maps, know how to navigate using conventional tools, and always remain aware of your surroundings. That said, let’s talk about ways you can use your smartphone to your benefit. There are a number of great apps that can be used for mapping and navigation for hiking. Some of the best ones have web and desktop options that can be used for pre-hike planning, as well as the ability to save hike routes to the phone for use while disconnected from internet access. This is not an all-inclusive list, but it provides some examples of good quality, popular apps, as well as suggestions for use. Gaia (https://www.gaiagps.com/ ): This popular service can be used from the browser, and offers Android and iPhone apps. The smart phone apps can be used to download routes for disconnected navigation. Regardless of whether you have downloaded maps or routes, this app (like many others) can be used to record a GPS track of your hike for reference during and after the hike. AllTrails (https://www.alltrails.com ): This service is well done and easy to use, offering many features similar to Gaia. Like Gaia, some of the features may only be available with a paid subscription. Avenza (https://www.avenzamaps.com ): Avenza is a free smartphone app, which provides access to a Map Store. The Map Store has a large number and variety of maps that can be downloaded for offline use. These range from free USGS quads, to paid digital versions of high quality trail maps for Pisgah and The Smokies. There are also ways to import custom maps as Geocoded PDFs, which are beyond the scope of this article. Backcountry Navigator (http://backcountrynavigator.com ): This popular outdoors app is currently only available for Android, though a new version (Backcountry Navigator XE) is expected to come out soon, adding support for web and iOS use. trails.io (https://trails.io/en/ ): Similarly, this app is currently available for iOS only. It has the distinction that it can be used entirely on your phone, without requiring any data to be shared online. 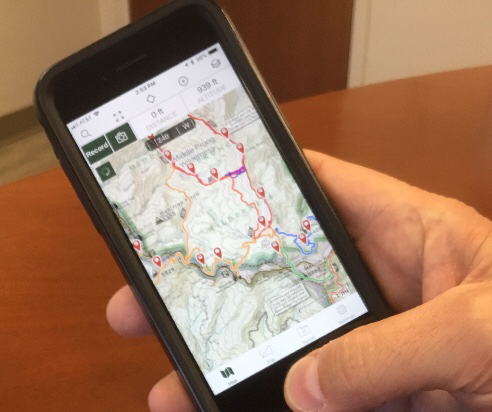 The bottom line is that there are many smartphone apps, combined with online services, that provide excellent options for hike planning, hike tracking, and track management. Find one that you like, and give it a try. The cliche that the “The best camera is the one you have with you” is especially true for hiking. While they will never compare to the optics of high end cameras with interchangeable lenses, the cameras on recent smartphones take remarkably good photos, and they improve every year. They are also much lighter, faster to deploy, and easier to share photos than most of those conventional cameras. You will be wanting to pull out your camera even in rainy or damp conditions. Many recent phones are waterproof, but you should at least have a waterproof case. Make sure you have a protective case for the phone as well. If possible, it is a great idea to have a lanyard attached, to avoid dropping the phone off the edge of that waterfall. Take the time to learn about the features of your phone’s camera app, because that will make it faster and more fun to use on the trail. For example, learn the shortcuts to quickly open the camera without having to unlock the phone. We have all read tragic stories about people falling to their death while taking “selfies.” Don’t let your use of the phone camera distract you from remaining aware of the situation around you. As you get more advanced, there are numerous third-party camera apps that can help you do specific things (e.g., taking RAW images, slowing down the shutter speed, etc.). Take a lot of photos and try new things, and you may be surprised at some of the great photos you capture. PeakFinder (https://www.peakfinder.org/mobile/ ): This “augmented reality” app provides a real-time view labeling the mountain peaks that you see through the phone camera. Theodolite (http://hunter.pairsite.com/theodolite/ ): This app overlays the view through your camera with more data about what you are seeing than you knew you needed. Compass: Having a compass on your phone can be extremely useful, and the built-in apps are pretty good. Some additional ones that have more features are Pro Compass for iOS (http://hrtapps.com/procompass/ ) and Compass PRO on Android (https://play.google.com/store/apps/details?id=com.compasspro&hl=en_US ). Star Walk (http://vitotechnology.com/star-walk.html ): Get info on what you are seeing in the sky, night or day. There are numerous apps for plant and animal identification. Using the Amazon Kindle app or your phone’s native book reader (e.g., iBooks), there are many useful references available, such as knot tying, wilderness first aid, and trail information. The built-in magnifier and flashlight functions on your phone can be a lifesaver in clutch situations. The more uses you find for your phone, the more often you will be pulling it out. That clearly translates into more opportunities for it to get damaged, as well as more power drawn from the battery every time the screen turns on. There are countless protective cases available for recent smartphones, but they are not created equal. Do your research and find one that you are comfortable with. As stated previously, don’t forget about waterproofing. A phone that is waterproof is far better than relying on the case to provide it. Make sure to put your phone in “Airplane Mode” during the hike. This provides a tremendous amount of power savings, and it will not interfere with the use of the GPS at all. Your phone may have a “low power mode” which offers even further power savings (the iPhone’s, for example: https://support.apple.com/en-us/HT205234 ). This may not interfere with anything you would be using on your hike. There are many lightweight and inexpensive extra USB batteries that you can carry to recharge your phone in a pinch. Don’t forget to also carry a charge cable to go with it. You can find small (about 6”) charge cables, which are especially convenient. While there are many valuable uses for your phone while hiking, it is worth noting some ways that you should not use it. Even if you happen to have a cellular signal, your fellow hikers will not appreciate hearing you take phone calls, unless it is an emergency. Similarly, it would be most courteous to silence notifications, and playing music or other audio out loud is almost always unwelcome. In general, use common sense to avoid inflicting your technology on other hikers that would prefer to enjoy nature without it. Hopefully this gives you some ideas about how your phone can be useful on the trail. It may not be for everyone, but give it a try.